Bengaluru: Sai Praneeth sealed the semi-final berth for Bengaluru Raptors as his win enabled the home team to defeat Chennai Smashers 3-2 in the Premier Badminton League on Thursday. Bengaluru lost their first match but roared back into the contention by winning Chennai's trump match, which dashed visitors' semi-finals hopes as getting six points from the tie became impossible. After losing the first match, Bengaluru came back strongly as Praneeth beat veteran Parupalli Kashyap 15-11 15-12. Earlier, the hosts were off to a dreadful start when Chennai's doubles pair of Chris Adcock and Chin Chung Or beat Bengaluru's Mohammad Ahsan and Hendra Setiawan, who are former doubles world champions. Chennai won 14-15, 15-9 and 15-11 after Chris smashed into Setiawan's body for the final point. 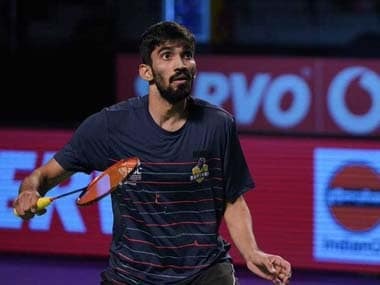 Maintaining his winning streak in this edition, Bengaluru's Kidambi Srikanth won the third and the team's trump match against Chong Wei Feng 15-10 15-10 giving his team a 2-1 lead. Spectators witnessed a high-level contest in the fourth match as Vu Thi lost to Chennai's J H Sung 10-15, 15-14 and 10-15. In the last match of the tie, the husband-wife pair of Chris and Gabrielle Adcock defeated Bengaluru's Marcus Ellis and Lauren Smith 8-15 15-10 15-4. Chennai were already out of contention for semi-final berth, but Chris did not give up and made Bengaluru pair to sweat it out for every point. Chennai won the decider easily.